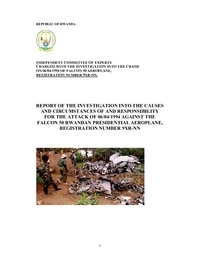 Rwanda's president, Juvénal Habyarimana, and Burundian president, Cyprien Ntaryamira, were killed when the Falcon 50 corporate jet crashed after being hit by a missile while on final approach to Kigali. Both presidents were returning from a meeting in Tanzania to consider ways to implement an agreement setting up a transitional government in Rwanda, intended to be in place until multi-party elections could be held. This meant that power would be shared between the Hutu population of Rwanda and the Tutsi-led Rwandan Patriotic Front (RPF). Hutu extremist members of the president’s inner circle viewed the agreement as an existential threat to a Hutu-dominated Rwanda as well as their own political and economic standing. These men were not simply opposed to a reconciliation process; they were committed to the wholesale extermination of Tutsis. One of these men was Théoneste Bagosora. Colonel Bagosora was intimately familiar with the president’s travel schedule and sufficiently powerful that the night before the summit, he was able to change the composition of the Rwandan delegation to ensure that Army Chief of Staff General Déogratias Nsabimana -who opposed Bagosora’s genocidal plans- would be on the president's plane. Using a proprietary radio network, Bagosora was in direct contact with elements of the presidential guard, the para­commando battalion, and most importantly, the Anti­Aircraft Battalion (LAA). These units were located in Kanombe Camp, near Kanombe International Airport in Kigali. The LAA, which Bagosora personally commanded for several years, was not only responsible for the security of the airport, but had anti-aircraft weapons stationed in the immediate vicinity. Through their private communication channel, the conspirators tracked the progress of the president's Falcon 50 aircraft from the moment it left Dar es Salaam to return to Kigali. As it flew west toward the airport, the conspirators fired two SAMs from an area just east of the runway and toward the northern part of Kanombe Camp. At least one of the missiles struck the left wing and fuselage, causing the plane to crash into the grounds of the president's Kanombe residence. The death of Hutu President Habyarimana triggered a massive wave of genocide in Rwanda that finally ended in July 1994. Distance from Dar Es Salaam International Airport to Kigali Airport as the crow flies is 1138 km (711 miles).